A landmark Vancouver condo tower that won architecture awards before construction even began is nearing completion -- and that's actually bad news for investors hoping to flip their units before the building opens and get out with a tidy profit. 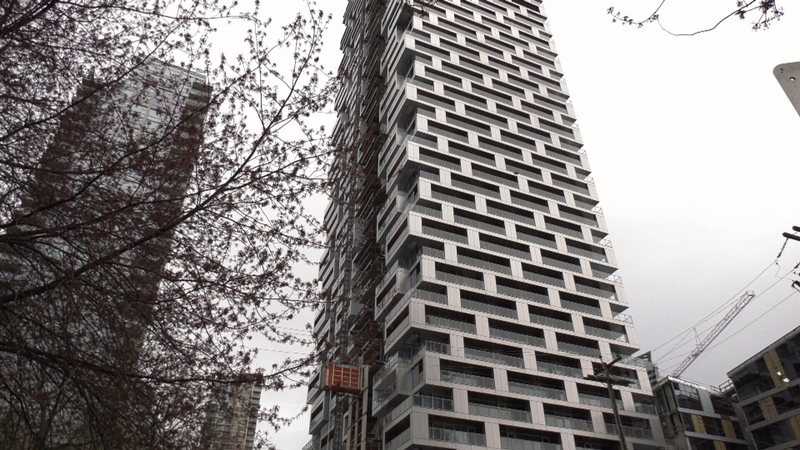 The 407 condos at Vancouver House sold out quickly when they went on sale in 2014, with many selling for several million dollars. Some units have been resold since then in a process known as assignment sales. "It's like the stock market," said realtor Vince D'Ovidio. "When do we get in? When do we get out?" As of Monday, 31 units in the building were listed for assignment sale, with many of those owners likely to have only made a down payment so far. Construction is expected to wrap up in the next 60 to 90 days and that means anyone who hasn't managed to resell their unit already has to settle their bill with developer, Westbank Corp. The company sent a notice to owners that it was time to remove their listings from MLS -- not uncommon when a building nears completion. "Purchasers are entering the 'closing period' where they need to attend a developer walk-through, arrange a mortgage if required, meet with their lawyer or notary to do the paperwork to close and then obtain their keys," Westbank said in a statement. One realtor, Karim Virani, has seven units for sale in the building, with a total asking price of more than $46-million. Two of those units are penthouses listed for more than $10-million each. Reached by phone, Virani told CTV News his clients wanted to sell for a variety of reasons, including personal circumstances that have changed in their lives since they bought in 2014. He says he's not worried about his clients closing their deals with Westbank in the meantime. According to D'Ovidio, for multi-million dollar units, the developer may have requested down payments of 20 to 25 per cent, more than a $1 million in some cases. If the buyers are unable to secure financing and are forced to walk away from the deals they signed, they will forfeit their deposits. But D'Ovidio says that's unlikely, in part because even in this slumping market, real estate is still worth more than it was in 2014. That means buyers who walk away are sacrificing not only their deposits, but the profit that has accumulated since their purchase. "The minute they close, where they own the suite, and there's no restrictions, they're putting it back on the market," said D'Ovidio when asked what investors were likely to do. "Take what profit is left and then move on." Once buyers close, if they don't actually move in or rent the condos out, they could be subject to speculation and empty homes taxes. Vancouver House is seen in this image from April 2019.